Mesopotamia Daily Life in Babylon - HISTORY'S HISTORIESYou are history. We are the future. ​Daily Life in Babylon: As the civilization of Sumer weakened, the Babylonians took over. King Hammurabi declared Babylon to be the capital of Babylonia. The Babylonians had a different language than the Sumerians. However, they believed in most of the same gods. To the Sumerians, Marduk was an important god. To the Babylonians, Marduk was the most important god of all. What is the name of the king who declared Babylon his capital? Above, an ancient bust of King Hammurabi. 3500 years ago, ancient Babylon was quite a place! It was a massive walled city, with a network of canals and vivid green crops. In ancient times, it was the custom for each city to select one god as their special patron. It will probably come as no surprise to you to discover that the special patron god selected by King Hammurabi for his capital city of Babylon was the one and only, chief of all the gods, Marduk. Since the city was built in honor of Marduk, it had to be the best city in the world. Indeed, for its time, it probably was. While Babylon was both large and crowded, Babylon remained greatly calm and at peace for a city of its size. Order was kept by Hammurabi's Code of Law, a stele standing in the center of town with each of Hammurabi's laws engraved in the stone. Because his Code of Law is recognized as one of the word's first set of written laws, it may be what Hammurabi is best remembered for. Due to the law and order provided by Hammurabi's code, the city thrived. Due to its central geographic location, situated between cities to the north and cities to the south, Babylon became a center for trade and the city prospered. There was much to buy, like fresh fruits and vegetables, baked breads and cheese, warm coats, gold jewelry, and date wine. Inside Babylon's walls, life teemed. Homes: A typical Babylonian house was designed with three floors and with a flat roof. Even the very poor, who lived in tiny townhouses, had three levels of living space. The first floor in each house, usually comprised of a courtyard, was very important. Behind the home's front door, a visitor might find a tiny garden and domesticated animals such as chickens. Why were rooftops important to the ancient Babylonians? Rooftops were especially important. People had easy access to their roofs from inside their homes. Roofs were flat for a reason. Flat roofs provided a fourth living space. Much of a Babylonian's life was spent on their roof. Why? Remember, Babylon was a walled city and these roofs were inside the city walls. Remember also that Mesopotamia is a desert region. Roof tops gave the Babylonians hope of catching a breeze off of the river and getting some relief from the desert heat. Consequently, Babylonians cooked and even slept on their roofs. Some of the fancier roofs were designed with four walls for privacy, and some had grape arbors that provided food and shelter from the sun. Inside the walled city, the streets in ancient Babylon were very narrow. Most streets were unpaved. Streets or alleyways provided access to everyone’s front door. The streets also served as a garbage dump. People simply threw their trash out the door. Occasionally, the city covered the streets with a new layer of clay. This buried the trash, but made the level of the street higher. It soon became necessary to build steps down to your front door. Most people filled in the area between the road and their door and, if needed they punched in a new door and built up. What is the name of Babylon's ceremonial gate? Babylon was a sight. Even from a distance, Babylon was an impressive place. Visitors could see the top of the 300-ft. high ziggurat, or temple tower, in the city’s center long before they reached the huge city gates. Procession Avenue: One of the most impressive sites was the street that led into the city. This street was called Procession Avenue. Huge pacing brick animals were positioned along both sides of the Avenue as decoration. The Avenue passed under elaborate gates dedicated to the Babylonian goddess of love, Ishtar. The Ishtar Gates were designed with dragons and bulls in honor of Babylon's patron god, Marduk. Most mythical dragons have wings. Marduk’s dragon was wingless. It looked somewhat like a huge dragon dog. The Procession of the Gods: Each year, during the New Year Festival, statues of the gods were paraded along Processional Avenue. The statue of Marduk, Chief of all the Gods, led the parade, attended by his caretaker priests. Next in line was a statue of Marduk’s goddess wife attended by her caretaker priests. The third statue in the parade featured the sun god Shamash. More statues followed, in a seemingly endless procession of gods and goddesses, each attended by their	respective caretaker priests. When the parade reached the Euphrates River, each statue was carefully placed into a waiting boat, one statue per boat. As they were loaded, the boats sailed or were rowed in a continuing parade toward the Garden Temple. When the boats landed at the Garden Temple, each statue was transferred to a waiting chariot, one statue per chariot, and the Procession of the Gods continued. At the end of the procession, the statues were returned to their temples. Each major city in ancient Babylonia celebrated the festival of the New Year in much the same way. 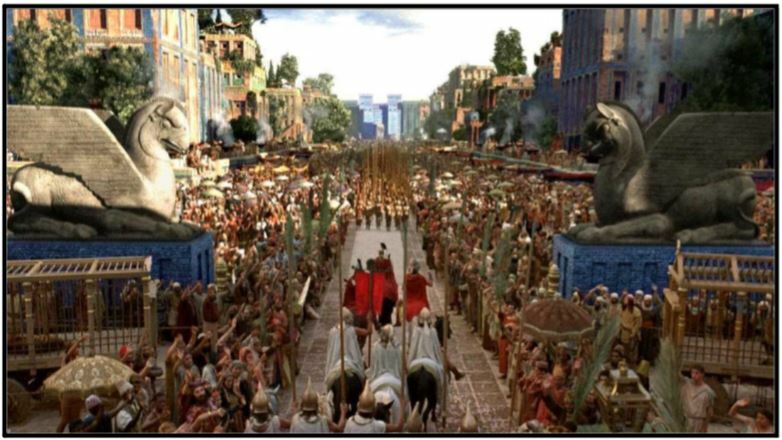 Many people, however, braved the terrors of travel so that they could visit the capital city Babylon at festival time because they so wanted to see its famous annual Procession of the Gods. Who was the patron god of Babylon? Hanging Gardens: One of the Seven Wonders of the ancient world, the Hanging Gardens of Babylon may have really existed. Some historians believe the gardens existed, but that they were built in another ancient town. Legend says that the Babylonian king, Nebuchadnezzar, built the Hanging Gardens to please his wife who was homesick for her native land, Media. In order to make her happy, Nebuchadnezzar built the Gardens to resemble a mountain from her homeland. He even had the Garden's plants imported from Media so that his queen could spend hours walking through the gardens, be reminded of her homeland, and be cured of her homesickness. The Hanging Gardens were perhaps the first roof garden. Although the garden had walls, the top of this massive area was left open. The tops of trees could be glimpsed from a great distance. To the traveler approaching the city, this gave the appearance of a garden hanging in thin air, and that is how the garden received its name. The gardens were terraced, and rose about 75 feet high. There were flowers and fruit trees and cascading waterfalls. The gardens were built as a gift of love from a king for his queen. Brainbox: What problems might arise from people throwing their garbage in the streets?